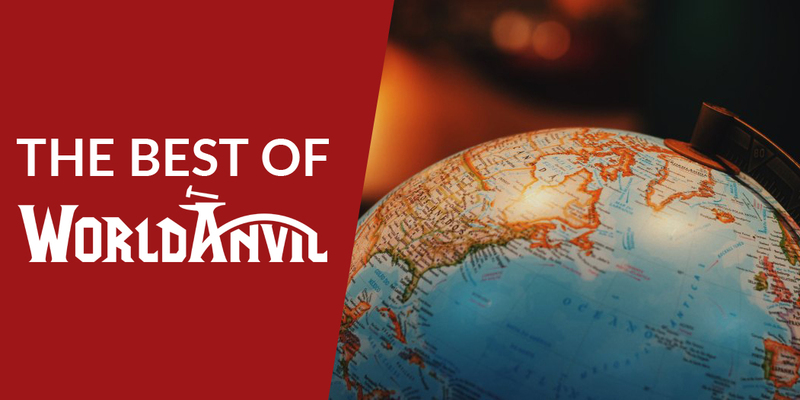 At its core, World Anvil is a tool to help you organize your creative process. 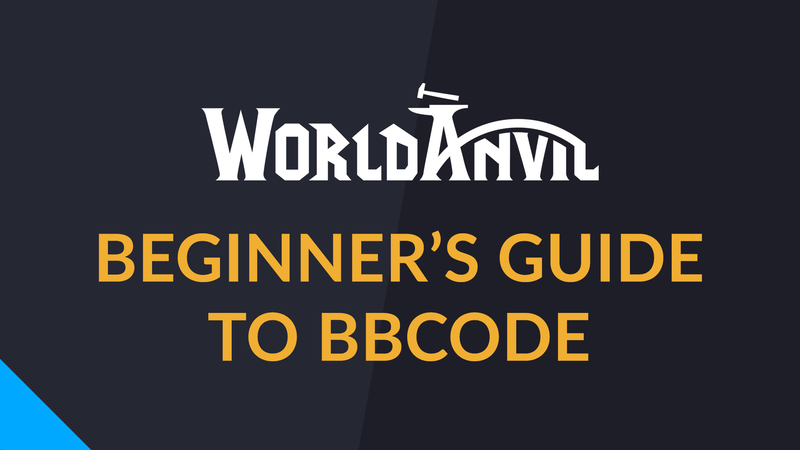 As such, this is not a definitive guide on how you should use World Anvil, but rather what you can do. When you enter World Anvil, you will access your Dashboard. If you have just created your account, the central part of the page will most likely be empty. Otherwise, it displays your worlds (red box) and your characters if you are playing in a campaign (blue box). The sidebar (highlighted in green) displays community information: current challenges, the theme of the month, announcements and an invitation to join the Discord. At the bottom of the page (highlighted in purple) there are four articles that have been recently liked by the community. You can visit them and give them some more love! At the left side of your screen, there's always a menu (highlighted in yellow in the screenshot). This menu is a quick access point to different parts of your world. At the bottom right corner of any page, including in the presentation view, sit the two (or three, if you are a guild member) "power buttons". The green power hammer is a quick-access menu to different parts of the world, while the purple power quill is a quick article creator. Click them to experiment! Finally, at the top of your screen, you have two menu bars. The blue one is a general menu, while the options in the black menu change depending on which part of World Anvil you are. If you have not yet created a world, go ahead and click the pink "Create a new world" button to create it. If you have, click on the "Access world" blue button to access the world summary. "View your world" button: click it to view the world from the presentation view. Getting started checklist: some suggestions for things you can do to get your world started! To-do list: it will be generated automatically every time you create a link to an article that doesn't exist. World word count: it's 10,000 by default, but you can change it in the world configuration. It's great to see your progress! Finally, at the bottom of your page, you can see community information: announcements, the featured articles, links to the store and blog, and the theme of the month. As always, the power buttons and the left menu are in their respective places. You might have noticed that the top black menu has changed... let's take a closer look! Your world's name is displayed in pink. If you click on it, you can switch the world you are working in (if you have more than one) or create a new one. The World summary button will take you to the interface explained above. The "Go to world..." menu is a quick access point to different interfaces of your world (list of articles, maps, categories, images, etc.). The left always-on-top menu has exactly the same items. The "Create..." dropdown is a quick creation menu for the different types of content your world can have. The green power button has similar functionality. The "View" button will take you to your world's main page in the presentation view. The "Configuration" button will let you change your world's settings. The Search field lets you search for articles in your world from the edit view. This section contains brief explanations for the pages you can access from the "Go to world..." menu (or the left menu, or the green power hammer). This is a full list of all articles in your world. You can order the list alphabetically or in "tree view" to have a better understanding of their organization if you have sorted them into different categories. Categories are a way to organize your world's articles. For example, you can have a category called "Birds" and fill it with articles about birds in your world, and then put the Birds category in a wider "Animals" category. This page lets you see all your world's category, both in the tree and alphabetical view. The map functionality of World Anvil lets you display the geography of your world (or parts of it) in a very interactive way. This page is just a list of all maps, with a link to view and edit them. A guide on how to use the different map features! Timelines let you display the history of your world, a country or a person in a very visual way. From this page, you can access your world's timelines, historical entries, and calendars. This page displays all the images you have uploaded to your world, as well as the images galleries you have created. It's also the page you use to upload images. Keep in mind that you can't use external images; you need to upload them if you want to use them in articles. A quick and easy guide that explains how to add and use images in your world. You can access the Notebook from the top blue menu bar, and you can use it to quickly jot down ideas that you have but that you don't know how to make them fit in your world. You can attach an image to them, and select a related article (in which case, they will appear at the bottom of the article, only visible to you). Only you can see your notes, so using it is also a great way to develop ideas that are not mature enough for public display. Featured article: it appears at the top. It's an article selected every day by the Enchanter team. Most liked articles in the last 3 days. Most viewed articles in the last 3 days. Newest articles created in any (public) world. If you are in need of inspiration, this page is an amazing resource to see what your fellow worldbuilders are working on! World Anvil Menu (Blue) This Menu, usually found along the top of any page on the site, provides the main way of traversing through World Anvil. World Menu (Black) Located directly below the WA Menu, this navigation tool helps you get around the various parts of your World Editor. As such, it is not accessible when in the Presentation View. Editor When building, this view will be the most common sight you see. Presentarion Usually seen by your readers, this is the pretty, code-free side of the site.